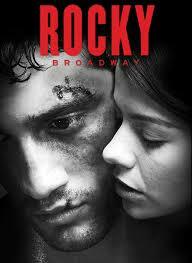 For whatever its flaws, Rocky the musical wins with a knockout final scene that is, guaranteed, unlike anything you’ve seen in the theater. Even more so for those lucky enough to have tickets in the first dozen or so rows at the Winter Garden Theatre. For the crowning Apollo Creed boxing match, those patrons are invited onto the stage and allowed to sit in bleachers around an orchestra-pit-anchored boxing ring.